March 2, 2010: The popular SPIN GEAR roller-coaster ride at SEGA Republic, the first of its kind indoor theme park in the region located on Level 2 of The Dubai Mall, has completed an astounding 30,000 kilometres in just five months! Among the most popular attractions at SEGA Republic, SPIN GEAR occupies nearly 20% of the total area of the theme park. With a total track length of 363 metres, SPIN GEAR travels up and down over 50 metres and twists and turns a minimum of 2,790 degrees, assuring an unmatched adventurous journey for guests. Mr Joe Gibbons, General Manager, SEGA Republic, said the sense of adventure and fun offered by SPIN GEAR is unparalleled in the region, making it one of the most popular attractions among visitors. “The popularity of SPIN GEAR is reflected in the distance covered by the roller coaster ride in a short span of five months. Emaar Retail will introduce a series of gift ideas linked to SPIN GEAR to further encourage the adventurous,” he added. Unlike the usual roller coasters, SPIN GEAR comes with a themed story that adds to the interest of participants. 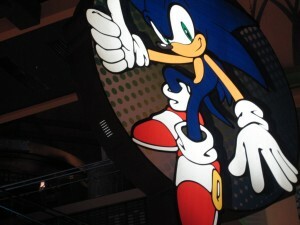 The themed ride is based on story of the evil plans of Dr. Eggman, who is Sonic the Hedgehog’s arch nemesis. Dr. Eggman has taken over an old factory facility and has developed a prototype weapon, SPIN GEAR, for capturing Sonic the Hedgehog. Now all he needs are ‘test subjects’ and there is only way to escape his evil plans – on a rollercoaster ride that will have everyone’s head spinning. The ride features spinning Sonic Gondolas and operates in both day and night environments. With a track width of 25 metres and depth of 56 metres, SPIN GEAR operates at two lift speeds – 2.5 metres per second and 2.3 metres per second – and has the fastest speed of 45 km per hour. The 76,000 sq ft indoor family theme park at The Dubai Mall is designed by experts at SEGA® Corporation, the world leader in indoor entertainment. SEGA Republic features five zones – Speed, Sports, Adventure, Cyberpop and Redemption – offering an array of everything from action packed motion-simulators to simulated sports games, classic carnival games and one of the region’s largest selections of prize-winning redemption games. There are more than 200 amusement games that will appeal to all. In addition to SPIN GEAR, other adrenaline-pumping attractions include SONIC HOPPER, LET’S GO JUNGLE! SPECIAL, HALFPIPE CANYON, WILD JUNGLE, STORM-G, WILD JUNGLE, OUTRUN 2 SPECIAL TOURS SDX and INITIAL D4 LIMITED. The theme park operates from 10am to 11pm Sunday to Wednesday and 10am to 1am Thursday to Saturday. Other leisure attractions at The Dubai Mall include the recently opened KidZania®, an edutainment centre for children offering 70 role-play opportunities; the 22-screen Reel Cinemas; Dubai Aquarium & Underwater Zoo; and the Olympic-sized Dubai Ice Rink.